A few months back, Steve “aggregator-in-chief” Woodruff started a daily blog series called “Five in the Morning”. Through the series, Steve shares recent posts and news items from his feed reader that he finds interesting. Wednesday night, Steve and I got together to talk shop and to enjoy some award-winning, Bobby Flay-slaying BBQ ribs. Somewhere between the 13th and 17th napkin, Steve mentioned that he wanted to franchise the Five in the Morning series to cast a wider net around the great content available out there. When he asked if I wanted to give it a shot this week, I said sure. So without further adieu, here are five posts that I think you’ll find interesting…. 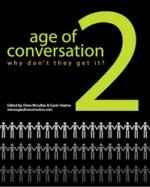 Forrester’s Bruce Temkin discusses the just released 2008 Customer Experience Index. As usual, industries with the least amount of competition clock in with the lowest customer experience scores. That includes Comcast whose overall index dropped a whopping 12 points since last year despite its ComcastCares efforts. Also, the post includes a link where you can download the complete Forrester report for free. The guys over at MyCreativeTeam explain why an old burglar with a reindeer fetish has such a strong brand. Social media consultant Matt J McDonald tells us that “Blogging is hard work” plus 15 other Simple Social Media Truths. 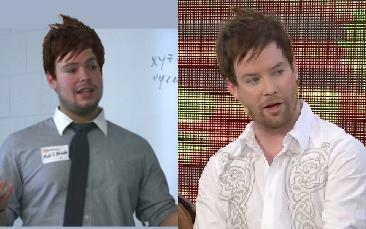 By the way, some believe Matt and American Idol David Cook were Separated at Birth (Go ahead, click the link. You know you want to). Crayonista Adam Broitman outlines three creative interactive marketing strategies that invoke consumers to talk to other consumers about brands, with minimal interference from the brand itself. Note: the post starts on Adam’s blog but continues at iMediaConnection. Last but not least, Amber Naslund picks up on posts from a few other bloggers and makes a great case for looking at old tools through new lenses. Can User Generated Content Hurt Your Brand? Folks in social media circles like to talk about the value using customers as brand ambassadors who advocate for the brand through social media. Of course, armed with a video camera and an internet connection, people don’t need to be asked by brands to be ambassadors. Remember Nick Haley’s iPod Touch ad? The really passionate ones just do it. When it comes out as good as Nick’s did, the brand can’t help but be happy. But what if your passionate customers create something that really doesn’t represent your brand in a helpful way. What if it’s so “cheesy” that it starts getting some serious YouTube traction. Is this kind of free advertising,”good” advertising? Chris Abraham pointed this one out on his blog today. The person that made this video (and I assume composed the song) is clearly passionate about Hillary Clinton. I wonder if this is the kind of brand ambassador Hillary is looking for. Is soon as the title of this post hit Twitter, I received a couple of comments suggesting that UGC won’t hurt your brand if you properly supervise it’s creation. That’s great if you are in-charge, but that’s not what I’m talking about here. There is no way to supervise or manage this. You can only respond to it (or not). So how does user generated content like this affect a brand. Is it helpful? Can it be detrimental? If it happens to you, how will you respond? All of these past slogans describe brand perceptions that Circuit City aspired to but failed to achieve. Why? Because a company’s brand is not defined by its catch phrase, logo, aesthetic style or culture. A company’s brand is ultimately defined by the experience they deliver to their customers and Circuit City has been unable to consistently deliver experiences that supported those brand promises. The latest revival of the Simplicity theme is part of a larger strategic framework that I helped develop for Circuit City a few years ago (you can hear about it here). Making it Easy for customers to shop, buy and enjoy is one of the four key ingredients to the vision my team proposed. We also recognized that delivering experiences consistently supported the “Make it Easy” idea would require significant changes in processes, culture and internal success measurements. Almost two years after those recommendations were made, Circuit City has “re-branded” many of the same operational features that they have been touting for years with the “Simplicity Guaranteed” label, but has not done any of the heavy lifting required to support the long-term strategic vision of sustainable growth through exception customer experiences. Identify your reasons to believe. On Christmas Eve, we decided to purchase an iPod for a relative. In the weekend tab, Circuit City was advertising a free $15 iTunes card with purchase of a Nano priced at 149.99. Electing buy on-line and pickup in the store (A feature that usually does live up to the Simplicity promise) we went to the web to place the order. We were surprised and delighted to see the web price of $142.49, but noticed that there was no mention of the free iTunes card on the web. Here is the first indication of a problem. The tab touchpoint and the web touchpoint are not aligned in terms of the offer. This generates confusion and apprehension for the customer. We made the purchase and left, with tab in hand, for the local store. When we arrived, the iPod was waiting for us as promised, but there was no $15 iTunes card. Our concerns about the conflicting offers are validated and we are now entering confrontation zone. We showed the tab to the customer service associate who wasn’t sure how to deal with the situation. Someone else was brought over to correct the problem. He suggested to “return” the web order and resell it to get the iTunes deal. The CSA did that, but in doing so, the price went back to the advertised price of $149.99. The CSA called the assistant back and the process of “fixing the order” began. At one point, we were told that we owed another $0.70. At another we were going to get $).09 back. Clearly, the front line associates; the ones that come face-to-face with the customers every day, are not prepared to deal with this problem. The processes have not been optimized to deliver a great experience. With the line backing up behind us, the CSA team finally found a way to make deliver the transaction with the free iTunes card at the price advertised on the website. The total in-store transaction time was over 20 minutes. Our expectations were not met and the other customers in line behind us got to share our experience as well. So did Circuit City satisfy their 24/24 guarantee. Technically, yes as the web order was ready in less than 24 minutes. Did the experience reflect “easy to shop, easy to buy”? Absolutely not! Circuit City has not identified and evaluated all of their touchpoints against the “Simplicity Guaranteed” reason to believe. They have not designed optimal customer experiences that include these touchpoints, and they have not aligned the various channels and business functions to deliver an optimal experience. This may sound like an isolated incident, but it is not. Where else is dealing with Circuit City not Simple? How about rebates, scheduling an in-home service or getting a product repaired under warranty if you didn’t buy the extended service plan? Circuit City was once a retail powerhouse. They practically invented the “Specialty Superstore” concept. Today they are struggling to remain relevant in what has become a commodity market. They have to compete with mass marketers like Wal-Mart and Costco who can price aggressively, niche players like Gamestop and Verizon who can beat them at the “authenticity” game and web marketers like Amazon and eBay who can always deliver a better selection and competitive prices. At $4.62, their stock price is trading a 52-week low and is flirting with a 5-year low. Circuit City will have to find a way to build a truly differentiated brand if they are going to survive. Simply adopting a new slogan that says you “make it easy for me” isn’t going to cut it. They must also consistently deliver a customer experience that supports the claim. Without that, the slogan only serves to set expectations that won’t be met and further erode the brand. Many of you may have shopped Circuit City in the past couple of months. I would love to hear about your experiences and your ideas regarding how Circuit City could improve the customer experience. To my regular readers, I’m sorry that the blog has gone a little stale over the past week, but I’ve been a bit preoccupied trying to find a new job. Nevertheless, traffic is way, way up on the Sprint post and I have been having lots of great conversations with people who have commented on it. In lieu of a new topic, which I promise to get to this week, I’ll pass on some of those additional thoughts from my conversations. Perhaps if Sprint were a Sense & Respond organization, they would be joining in the conversation or at least be actively listening. My guess is they’re not. Of all the comments on the post, no one defended Sprint. To the contrary, all but one had negative things to say about them. The other guy just had negative things to say about female cellphone users. Thought certainly not a statistically valid sample, I would wager that few people really love their wireless provider. It’s the nature of the industry in the US. With limited competition due to the high cost of entry, the wireless providers aren’t compelled to differentiate on customer service and in my experience, Sprint is the poor service leader. Out of Sprint’s 52 Million customers, only 1000 received the letter saying they were calling customer support too much. Do the math. That’s less than .002% of their customers. There is no way that that small percentage was adding any material cost to their operation. (update: As a friend pointed out, the actual cost of these calls could have been material; however, the methodology for counting is unclear. For example, the ABC story indicates that a single call with 5 internal transfers might have been counted as 5 calls). Sprint says that, on average, these customers were calling in 40-50 times per month. Perhaps that’s true and given my personal experience with trying to get my own Sprint bill fixed, I can appreciate that. Nevertheless, Sprint made the decision to go after them in a way that became very controversial, very public, very fast. The cost of this action in terms of bad PR is on par with Circuit City’s recent bungle. where they fired 3400 of their most experienced store employees to cut costs. Several months later they are still trying to explain that one, but it’s too late. In both cases, the damage to public perception has been done, although in Sprint’s case, it was pretty low to begin with and their defensive spin machine is just getting fired up. In my opinion, it was a failure of leadership in both of these companies to make such shortsighted decisions without considering how their customers would view them. One of my conversations this week was with the Conversation Agent herself, Valeria Maltoni. She pointed me to a post she wrote about the wireless business in the US and speculates that Apple may be just the disrupter needed to shake up the industry. It’s a great post and has some David Letterman Top 10 humor to boot. I was a Sprint customer for a while. I hated every minute of it. The coverage was spotty and their ability to screw up the billing month after month was unprecedented. Every month, I would call their support line, wait on hold for 30-40 minutes, and then have to explain the problem (usually se same problem as the previous month). Once the contract was up, I fired them. Today, Gizmodo is reporting that Sprint is firing some of their customers for, are you ready for this, making too many customer service calls regarding billing and other account info. As outlined in letters to certain customers, Sprint is giving them 30 days notice and then they are shuuing off their phones. In a rare moment of weakness for cell phone carriers, Sprint is going to let these customers go without having to pay early termination fees of the last month’s bill. Sprint deserves some seriously bad press over this incredibly stupid approach. Here’s my suggestion to Sprint: Before you start firing your customers, you should take the time to understand the source of the problem. It’s probably staring back at you when you look in the mirror. Disney’s parks and resorts have a well deserved reputation for delivering great experiences. In tonight’s installment, I’ll give you a few more examples from my recent trip and also examine some experiences that don’t measure up to the Disney standard. I have written about Disney’s Magical Express before. This is the service that basically extends your Disney experience all the way back to your home airport. It’s absolutely great when it works, but on the inbound leg of this trip, it did not live up to the Disney standard. I think the problems can be traced back to the fact that Disney does not operate this service. It is outsourced to a local transportation company and therefore is not directly managed by Disney. It’s not unusual for companies to outsource parts of their operation, but they need to be very careful about ensuring that the service provider is consistently delivering an experience that lives up to your brand. My wife and I came in on different flights. English was apparently a second language for my driver and so he was silent for most of the trip. The buses have TV screens and on previous trips, there has been either a movie like Snow White or a video marketing the Disney Vacation Club. On this trip, there was nothing. It was just a bus ride. My wife and daughter arrived around 3:00pm. While their trip seemed to measure up to the Disney Experience, trouble was just around the corner. Knowing that their luggage was tagged and would be delivered to the room, we went to the Magic Kingdom for the evening. When we returned to the room at 1:00am, we discovered that our daughter’s suitcase was missing. With her in tears, we called the Magical Express people who were able to locate the bag at the airport in about 5 minutes. They brought it to the room around 3:00am. There are controls built into this system that should have prevented this from happening. The bag had the Magical Express tag on it indicating who it belonged to and what resort we were staying at. It should not have taken a phone call for them to recognize and resolve the problem. Disney needs to do a much better job of ensuring that their service providers are consistently delivering an experience worthy of the Disney brand. On the positive side, my return trip to the airport was wonderful. The driver was one of the better entertainers that I had seen all week. Oh, and about the lack of movies on the inbound trip, the driver explained that it was a brand new bus (styled for the Disney Cruise Line), and the video gear had not been installed yet. Setting expectations is a good thing! In recent years, Disney has incorporated more and more interactivity into their attractions. EPCOT’s Mission Space, for example, assigns roles and tasks to each of the riders on “the mission”. The Buzz Lightyear Astro Blasters ride in Disneyland allows you to not only rack up the points when you’re riding it in person, but also to participate through an online component. The Turtle Talk with Crush attraction uses digital puppetry to create a verbally and visually interactive animated character. 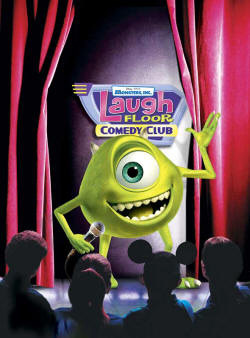 A new attraction in Orlando’s Tomorrowland is Monsters, Inc Laugh Floor Comedy Club. Like TurtleTalk but on a much larger scale, the Laugh Floor features interactive animated characters, but in this attraction, Disney has gone one step further by integrating the use of cell phone text messages into the attraction. While you wait in line for the next show, you are asked to send text messages from your cell phone to the monsters, offering your jokes for the monsters to tell. I saw lots of people, mostly kids, texting jokes while waiting for the show. We did it; they used our joke and gave credit to our daughter. What’s really different here is the use of an independent, guest-owned electronic input device to influence the content of an attraction. I’ll post the rest of my observations tomorrow, but in the meantime, think about how these points might apply to your business. If you are in the business of delivering experiences (hint… you are! ), what are you doing to extend the brand experience beyond the boundaries of your physical or digital space. If you are using partners to deliver some of you brand’s experience, are they executing consistently and at a level that your customers expect? Are you engaging your customers by allowing them to help you co-create the experience? You should be. Part 3 of this series is here.